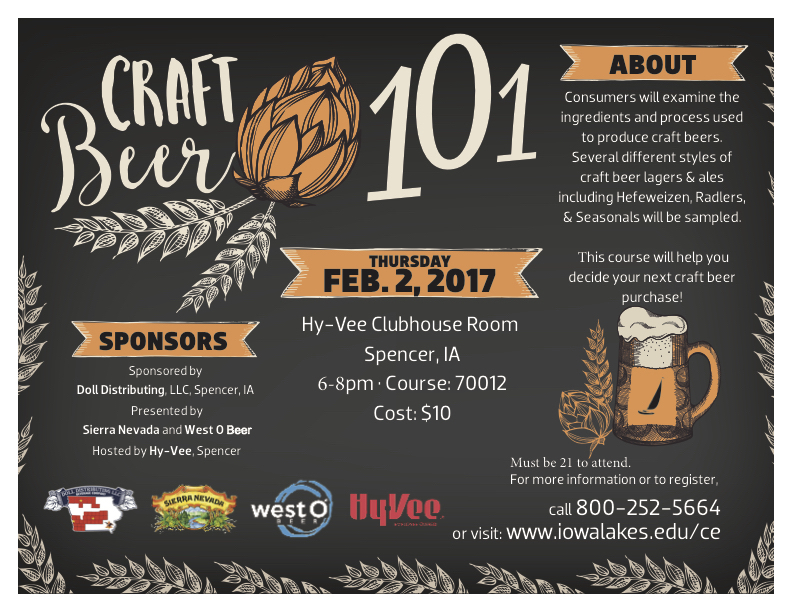 05 Jan Craft Beer 101. Listen up…Iowa Lakes Community College has a New Year’s resolution you cannot pass up. You know you like craft beer, and you kind of know which way you lean. Hoppy! Strong! Dark! Light! Well, check out this February 2nd event, because your beer journey continues here, grasshopper. Drink local, friends, because this event is sponsored by Doll Distributing in Spencer and hosted at the Hy-Vee Clubhouse Room in Spencer, and presented by West O and Sierra Nevada. Did we mention there will be samples? Yes, because you can’t learn about the finer points of craft beer without samples.